To lie in the grass . . .
Two days ago, I got myself in a twit. As I looked ahead to a week of busy-ness, and a trip out west to visit Pete, Shel, and Baby Viren on the other side of all that busy-ness, I panicked. How was I going to fit it all in? How was I going to feel good while fitting it all in? So, instead of moving forward on the projects at hand, I spent my Sunday morning creating lists, elegant lists written with my purple pen on fine cotton-bound paper. Each day of the week became a heading, and, underneath this heading, the columns of tasks and errands and people to call. I revised my week-long list, again and again and again, until it all fit on one side of the sheet, until it was neat and tidy, with enough white space to breathe – a neat and tidy “to do” list, a neat and tidy life, everything in order, everything getting done . . .
And then the day began to fill itself in. Things happened that weren’t in the Sunday column of the list. Cam arrived home from a morning of mountain-biking an hour earlier than I had expected, and, of course, I wanted to visit. And, I’d forgotten to allow time for eating, and, how could I resist all those market veggies and the pear-cherry tart, and who cares if I’m a little behind the agenda anyway?!? And when a grown-up son calls, there’s no question that it trumps the “to do” that’s waiting to be done. And how could I possibly concentrate on writing the blog-post that’s supposed to be next in my production line of a Sunday when the rain has stopped and the sun is bursting through those no-longer ominous clouds?!? And who can write a blog-post, anyway, when the pressure is on and the blog-post topic is intended to be about feeling free?!? So, in the late afternoon, in a diversion from a well planned-out day, off to the Lake I went. It’s not like I immediately let go of my twit. While sitting on the rocks on Superior’s shore, I gave it the college try, to stick to the list, to pump out that blog-post, long-hand in my left-handed scrawl. Except, my scrawl was not a scrawl at all; it was tight and uptight, and my blog about fearless creativity was a wound-up mess. And that’s when I wadded up the paper; that’s when I decided that I would let go of trying to write an essay about feeling free and just go for the feeling itself. And, in that moment, I realized what I really wanted to do was reach into my basket of writing goodies and haul out the pile of cards that I’ve collected during my summer of travels. I love collecting cards! I love writing letters to people! I love sitting by the lake while I write these letters! And that’s what I did. I began to write letters, and my scrawl became a scrawl again, loose and free, and I could feel myself breathing a bit deeper and noticing that the wind was soft and the lake was gentle, and the waves, they were mere wisps touching the shore. And it was the third card that I pulled from my basket that really turned my mood around; it was the quote by John Lubbock beneath the print of a tree and a stream that brought me back to my center: “To lie under a tree, listening to the murmur of the water, and watching the clouds float by, is by no means a waste of time.” Halleluiah! Of course, I know this! It is not a waste of time to lie on the ground and watch the clouds float by; it is my savior. Twenty-five years ago, I traveled to Nicaragua for three weeks with a peace group from Maine. The day before I left, I was in a frenzy, in a real twit, not peaceful at all. I had never left Cam and the boys for more than a long weekend, and I now I was heading to Central America for seventeen days. My to-do list was daunting and my nerves were raw and I certainly was not grounded and my thin façade of control was shattered when I backed down the driveway and ran over the white bike that my four year old had, unbeknownst to me, had parked behind my stationwagon. I remember that Chris was devastated. To a bike-loving four year old, it was an unforgivable act, even if his handy-with-things-like-that father could fix it like new. I also remember that I was devastated, too, that it stopped me in my tracks, that I immediately gave up on my to-do list. Completely. And I lay there on the front lawn of our Pansy Street home, and my two little boys, they joined me; for what seemed like a long time, we just lay there on that balmy summer evening and watched the clouds float by. I have no idea what was on that to-do list. I have no idea what got done and what didn’t. None of that mattered. What I do remember is how it felt to lie there on the grass with my boys close by. I remember it like it is happening in this present moment. It is like that when we pause; at least it is for me. When I pause and breathe, I push the save button in my inner computer and I soak things in deeply. And, this past Sunday, I paused, while sitting at the Lake and I waved to the two people in the canoe that glided by and I wrote three letters and I crumpled up a neat and tidy to-list and I decided I had more important things to do with my time. Our son, Chris, is a lover of life; his spirit is buoyant, his smile, wide and generous. I’ve known this forever. As a baby, he clutched his cloth ball and threw it with gusto and a giggle. And years later, while playing Little League for the mighty Elks, he continued tossing the ball with the same life-giving zest, and, all season long, before each game, he found that generous smile and that buoyant spirit, and he proclaimed that maybe, just maybe, this would be the one that they’d win. And later still, while racing down mountains on his high-tech skis, you could tell that it wasn’t just the taste of victory that spurred him on; you knew; you could see it in his body as he flew through the gates; you could see it in his face when he screeched to a halt at the bottom; it was the joy, the sheer joy of a wild ride that Chris loved the most. As a child, he carried this joie de vivre like a precious companion into all his activities, and he has brought it, this joy, this enthusiasm, along with him into adulthood. When people have asked me about Chris, these past six years, I’ve had a standard answer. I’ve told them that he’s in Salt Lake City, pursuing his PhD in Applied Math. And then, without a pause, I’ve quickly added the “but”. “But,” I’ve said, “that’s just part of his life. He skis and mountain bikes and hikes and fly fishes and creates beautiful pottery, and he loves his girl friend and their two dogs and he loves to play music and he loves to cook and he could open a café if he wanted to, and his garden, his garden has been something to behold . . .” I’ve gone on and on, telling people about the things Chris loves on the far side of that “but”. 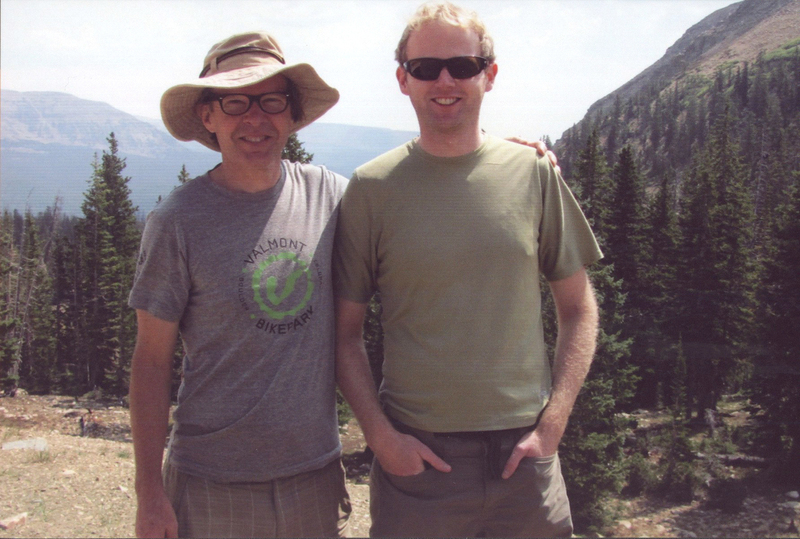 And they are all true; I’ve witnessed his passion for life during my twelve or so visits to Salt Lake City and it has been a wonderful ride playing with him on the hiking trails and in the winter snow. However, on this last trip, a week ago, the focus was different; the focus was on the part of the equation that preceded the “but”. After six years of study and research and teaching, after three summers of fieldwork in Kenya, after papers that have been published and problems that have been solved, Chris has reached the final pages of this chapter of his life. And last Wednesday, in a classroom in the University of Utah’s newly renovated math building, he stood before colleagues and professors, before family and friends, and he defended his thesis with an-hour long talk, a synopsis of the projects that he had been working on during this time in Salt Lake. And before he began, I said a silent prayer. Really, it was more of a stern lecture to myself. “Helen,” I said, “be present for your son. Even if you do not understand a word of his thesis, even if you do not have a clue what he is talking about, pay attention. Do not daydream. Do not look over and talk to Cam. Do not wiggle. Stay focused for your son’s big moment. Appreciate him.” And I did. I, who love to squirm and fidget, I, who haven’t opened a math book in thirty-five years, stayed still and breathed and willed myself to focus. And it wasn’t hard. The moment Chris stood up, clicker in hand, and flashed on that first slide, the moment he flashed on his genuine smile, I was on board. And I remembered what I had already known – that it’s easy to pay attention to someone who is speaking with passion. And, indeed, Chris was speaking with passion. And that’s when I realized that my equation wasn’t adding up, that interjecting a “but” into a statement tends to negate all that has come before it. And there was nothing negative about this synopsis. The same gusto and enthusiasm that had found its way onto the ski slopes of Snowbird and the hiking trails of the Uintah Mountains had also found its way into this talk. Chris cared about his subject matter. Chris cared about the work he had doing this six years in Utah. And to my surprise and delight, I cared about it, too. Sure there were moments when an elegant math problem or a fancy-looking chart would appear on the screen and my brain would go fuzzy. Sure there were times when the information didn’t even penetrate my brain at all. And . . . and I soaked it in, the gist of it. Not just the awareness that Chris is happy in his field; I also soaked in the information, soaked it in deep enough to provide an elementary synopsis to anyone interested in what Chris has been up to these past six years. And afterwards, of course, there was a celebration. Chris, lover of life, loves a celebration. And I learned that his professors and his colleagues and his friends, they do, too. So it was Sudanese food that Chris ordered, and a balmy evening, and the backyard of a professor’s house in the foothills above the city center and a game of croquet and a bounty of laughter and tales of mountain bike rides and tales of travel adventures and memories of times well-spent. It was a good evening after a good day, a day in which my knowledge of Applied Math became a bit broader, a day in which my equation for seeing my son became more expansive. I said it in yoga a few mornings ago, that we are all Olympians, champions of our own lives. And, when we are living these lives from the inside out, following the guidance of our own inner coaches, we feel it and we know it, that any moment has the potential to be podium-worthy, that every breath we take can be golden. And who can possibly judge what constitutes a gold medal moment for someone else?!? Sure, the Olympics inspire. It is exhilarating to watch these athletes from all over the world light up with passion and skill and brute strength, to witness as gymnasts fly, literally fly, through the air, as runners take off with a cheetah’s speed and grace, as swimmers, with their paddle-like feet and hands, stretch out long and propel themselves through water, as volleyball players react to a play before we, the cheering squad, have time to even focus on what they are reacting to. It is a pleasure to celebrate their beautiful bodies and their soaring spirits and the races that come together for them in a way that seems triumphant. And the pleasure of the Olympics began for me in Maine, the weekend of my mother’s Memorial Service. Cam and I, along with our son, Chris, had flown into Portland the day before, and, Friday, after a full afternoon of sorting through Mom’s treasures at my brother’s house, and a lobster roll at the famous sea-side shack, Reds, in Wiscasset, the three of us headed into Brunswick, to Frontiers, for a salad and desert. I had learned about Frontiers from my friend, Muriel, and I’ve become a regular on my recent trips to Maine at this hip café/art gallery/movie-theater located in a renovated mill on the banks of the Androscoggin. I knew that Cam and Chris would love the location and the ambience and the locally-harvested food; I had no idea, however, that the Opening Ceremony of the 2012 Olympic Games would be playing in their adjoining theater on the wide welcoming screen. So, while sharing a warm peach and blueberry cobbler, we, along with fifty or so other fans, watched as England, in its English sort of way, took us on a journey through British history and carried us forward to the present moment that we’d been anticipating when the eager and smiling athletes marched and waved their way into the stadium. It was a rousing full-screen beginning to these games. And throughout the weekend in Maine, we kept ourselves updated, as Bradley Wiggens and gang pedaled the streets of London, as Phelps and fellow swimmers splashed their way onto the podium. These Olympians and their games provided a joyous backdrop to the weekend in Maine, but the up-close and the personal, the interactions with friends and family, the countless ways that we all rose to the occasion – no matter what our age or physical prowess – they were the moments that were truly golden. George Dole, the minister at Mom’s Memorial Service is a family friend, someone who has known my mother his whole life. Although George never ran in the Olympics, in 1954, while attending Oxford as a graduate student, he had his own athletic moment. George was a distance runner, and, on a spring day nearly sixty years ago, he, along with several other participants, lined up at the Oxford track to compete in the Mile, a race that will be etched in our minds as the most famous mile ever. George came in fifth with a respectable time. Another man, a young British runner, however, flew through the finish line, smashing a barrier that had seemed impenetrable. It was the race in which Roger Bannister broke the four-minute mile. And it must have been exhilarating, the moments that followed, for the runners, for the fans in the stands, for the whole world as people realized the impossible had become the possible. I’m sure that it was exciting for George, too; he lights up when you ask him about it. However, I never even knew to ask him about it, until Pete, our son, took off on his own distance running journey. When Pete began shattering records in high school, it was my Uncle John, Mom’s younger brother, who told me about George’s infamous race. Since my childhood, I had known George as a scholar, theologian, translator, and a sweet family friend with a toothy smile and a twinkle in his eye. I don’t think he brushed away the thrill of that record-shattering day; I think he soaked it in. And then I think he moved on to other glorious moments, moved on with the things that he loves, with his scholarly pursuits, with his family life, with his running. George, in his eighties now, is still running, careful jaunts around the streets of his coastal town in Maine. His legs may have slowed down, but his spirit, filled with enthusiasm, is strong. So there you have it. We’re all Olympians! Gordon and my mother shared a gold medal moment! 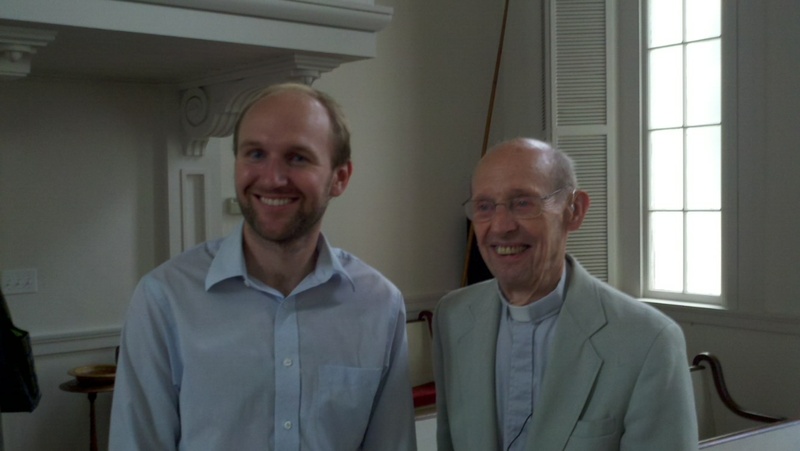 And Pete, after the service, visited with George — both scholars, who have studied at Oxford, both runners who have had their moments of glory, one in his early thirties, one in his eighties. I know they talked about that race where Bannister broke the four-minute mile. And why not?!? We bring those exhilarating peak moments into the present when we remember and share. We feel them again. And then we move on to the next moment and a new opportunity to light up and shine. It was like that when we returned from our trip to St. Petersburg, too. I couldn’t put it into words, the layers and layers of history dancing with the present moment, dancing in the present moment, and the emotions it conjured up. Cam and I, along with Cam’s mother, had traveled to Russia in mid-December, six and a half years ago, to visit with our son, Chris, who was participating in a semester abroad. I wanted to write about this grand adventure, to try to find a way to express how time unhinged itself, how you were pretty sure that it was Dostoevsky walking in front of you down that ice-covered street, almost certain that Catherine was alive and attending the opera, the uniquely Russian opera that carried you through the whole of Russian history. I found myself so full of Russia, of St. Petersburg and its layers and layers of stories, its past and its present, that all I could do when I returned to my life at home was share my photo collection and a vignette or two, along with some bright-colored candies and creamy chocolates and hand-painted trinkets. And now, I’m filled up again, the past permeating the present, filled up again with the layers and layers of stories, except this time the focus is close to home; it’s my family’s history, our personal opera that was brought center stage two weeks ago in Maine. It wasn’t a matter of jumping into a time machine, dislodging from the present moment. It wasn’t like that at all. In Russia, I breathed in the dim light of the December days and the glorious opulence of the Hermitage and the click click click of impossibly high heels and I admired the piles of wild mushrooms stacked on tables in the subway stations. I was there, in the Now, experiencing it all, and the stories that sang out from the palaces and the courtyards and the storefronts of Nevsky Prospect just added soul, deep Russian soul, to the adventure. And perhaps, it is only when you are really present in the moment, consciously breathing in the air that is right in front of you, that you are able to sense it, that that same air might have been breathed by Peter the Great or the Russian poet Alexander Pushkin, or, maybe, if you’re in Maine, for a weekend Memorial Service for your mother, by one of your own ancestors, a great grandmother or grandfather who came before you. So, I there I was in Maine on the last weekend in July, very much present in my body, breathing in the salt air, savoring the on-shore breeze and the smell of bayberries and the sun beaming down on my bare shoulders. And there I was in Maine, with my siblings in my brother’s house on the family property in West Point, dividing up treasures that our mother had held dear; there I was sorting through boxes and boxes of photos with my sister, and walking past my childhood house, the sea captain’s home of my elementary years, with my grown-up sons. There I was sharing my personal Maine history with my present-day friends, Mary and Cathy, who had driven east from the Upper Peninsula of Michigan for this weekend of celebration. And there I was, there we all were, congregating in the church where I was baptized and where I was married, gathered now all these years later on a humid, still, overcast Sunday afternoon. And how do you soak it all in, this poignant personal opera? You can write about the present day details, the flowers – the bayberries, zinnias, delphinium – gathered just a few miles from the cottage that your mother lived in for fifty years, how you and your sister placed them on the altar, in front of the lectern, on the sills of the tall New England windows of the church that the two of you used to know by heart. You can share how the people flooded into your childhood church on that still, humid afternoon, people you have known a long, long time – your aunt and your uncle, and cousins, cousins from both sides of your family, the boy cousins, the girl cousins, cousins and nieces and nephews and friends from near and far, and friends of yours and friends of your mothers, and friends who were like cousins and aunts and uncles. You can say that it was wonderful, this flood of people, this flood of emotion, this flood of stories. You can say that it wasn’t just the people, the living breathing people, so many of them, all dear to you, that it was impossible to visit in a slow satisfying way, that it was the others, too, the ones no longer in their bodies, the ones that are also dear, that crowded into that weekend in Maine. You can say all that, and you can say that the floodgates opened and the rain poured down, a true all-day soaking-into-the-ground rain. You can add that it wasn’t a dismal vodka-drenched rain, and the opera, if we’re thinking of this as an opera, wasn’t a tragedy at all, and the love on that rainy afternoon, it was palpable, and even if you can never really write about it, you have it in you, this weekend in Maine, this rainy afternoon, the stories, and the love that never really can be put into words. From the start, it wasn’t a somber affair. The air was calm and sweet, and a soft bank of clouds had rolled in over the ocean on this early Sunday morning. And, as we three siblings stood on the ramp at the water’s edge, waiting, our big brother, Richard, steered his twenty-foot lobsterboat, the one that he had built himself from strips of oak, into shore and picked us up at the high tide mark. Richard directed us to our seats, me in the bow, Auralie in the middle, and Ernest in the stern with his brother. It was fitting that Richard should be the one steering; after all, he had moved back to this land in Maine and he had carried on Daddy’s love for lobster-fishing and he had been the steady daily presence in our mother’s life all these years. You can taste the salty breeze and feel the ocean settle into your hair and you can’t help but smile when you head out of Fish House Cove on an early morning boatride. It’s always been that way, a tonic for happiness, and it was like that this past Sunday for the four of us. “It feels good!” Auralie exclaimed. “It’s perfect!” I added. And it was, to be heading out to sea, out toward the ledge that lies at the tip of Hermit Island. Ernest held a bottle of fine white wine and Auralie held onto the box, the box molded of cream-colored handmade paper and flecked with dried flowers and leaves, the box that Joannie, Richard’s wife, carefully, mindfully, had chosen last winter as the one that our mother would have loved. Auralie had been adamant the night before. “If you want to look into the box, you need to do it now!” she had said to her siblings and her children and her nieces and nephews. “I’m going to glue it shut.” So here she was, on her middle seat of the boat, clutching the sealed box, the eco-friendly biodegradable box, certain that its contents would stay safely secure. And here we were, speeding now, past Sister Point and Cat Cove, speeding toward Hermit Island’s tip and that ledge and the raft of eider ducks swimming in the ocean swells in front of us. And then Richard turned the engine off and the boat rolled in the gentle swells and he said, “This is the spot!” And I thought, this is the spot, this is the spot, right here, where Daddy’s ashes ended up thirty-nine years ago, on this ledge off of West Point in Casco Bay. This is the spot, I thought, where we’re going to toss this handmade biodegradable box filled with our mother’s ashes into the sea. And although it wasn’t a somber affair, it did seem as though there should be a level of formality. Auralie and I both took a turn, cradling the box in our laps, and speaking from our hearts to our mother, and Ernest stood up, ready with the bottle, and Richard, now holding it in his hands, leaned over the side of the boat, placed it into the water, as Ernest smashed the bottle against the boat’s wooden railing, and let it fly, the wine and the glass and the “God’s speed, Annie!” that the brothers called out. And the box, the box that was supposed to disintegrate, that was supposed to make our job neat and tidy and easy, it just bobbed away on the ocean’s surface like a cheerful buoy, and we watched it and we waited, waited for it to sink. But it didn’t. It just floated with the breeze. “I thought you put the rock in it, before you glued it shut!” Richard exclaimed. And Auralie cried back in a convincing tone, “I did! I know I did!” “Well, we just can’t let it float away!” one or all of us added. “We’ve got to haul it in!” So Richard handed to Ernest the long pole with its metal hook that he must use to pull in the ropes and buoys attached to his lobstertraps. And he started the engine and we chased it down, the bobbing box. Once it was caught, Auralie leaned over the side of the boat. “It just needs a good shove,” and that’s what she did; she shoved that box right under the water’s surface and held it there for a good long time, long enough to sink something that is supposed to disintegrate immediately. And we watched and we couldn’t help it – when it shot back up to the surface with gusto, we just couldn’t help it, we began to laugh, big and boisterous. And then I shoved it down and it shot back up again. Any formality went out to sea when Richard hauled out his rusty fishing knife and began to poke holes in its cream-colored hand-made surface. And then I just ripped it, the carefully glued on cover, and the ocean started pouring in, and the ashes, in their clear corn starch biodegradable inner bag, they rose up, and what was so hidden from view was right there in our sight, our mother’s body, now sandy and fine and looking like the ocean’s floor. And we set it free, with a minimum of words and fuss, we just let it go, the bag containing the ashes, and it swam its way down to join the sand and the sea and the fish below. And we were left with the box, still floating and bobbing about. “Let’s sink it out by the Wood Island’s bell buoy!” Richard called from the stern, already starting the engine. And once again, the stick with hook came out, and once again the box was hauled in, and once again, Auralie sat, on her middle seat, holding the box, now wet and warped and filled with rusty holes. It was a perfect morning, still, more perfect than ever. Our mother loved a good boatride. 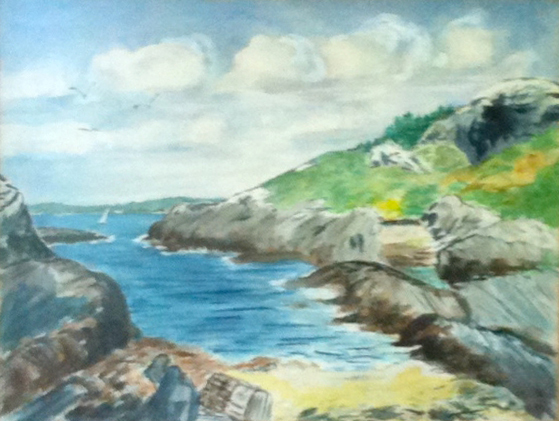 Our mother loved Wood Island where we picnicked and collected cranberries, where she painted with her watercolors. Our mother loved the bell buoy that rang its chime on the island’s open-sea side. “Do you mind if I straddle the bow?” I asked my brother, and I hopped up onto that bow like I did when I was a teenager and I dangled my feet in the water and we all laughed as we picked up speed. It was wonderful, the wind and the salt air and this added adventure. And that’s when someone hollered out to me to look around. And there they were. That’s when we all saw them. And granted, I haven’t been out beyond Wood Island in a very long time. But, in all those years of childhood boatrides, on all those picnic Saturdays and evening escapades, on all those lobster-fishing-with-Daddy-early-mornings, I’ve only seen them once, and that was in a bigger boat far out to sea. But there they were, in front of us now, three of them, flying, buoyant and free, up into the air in their sleek dolphin bodies and diving back down again, flying up and diving down, again and again. I couldn’t believe it and yet I could. Of course I could. There she was, our mother, laughing and playing right along with us. And the box, it sunk down with ease as the bell buoy rang in its steady wave-like rhythm.